On Stardate 201812.11, BDR Brian Allen, SFMC, COFORCECOM announced the appointment of LGN Paul Fest, SFMC as the 11th Officer In Charge of the 15th Brigade, 1st Division, STARFLEET Marine Corps. LGN Fest succeeds BGN Thomas Guertin, SFMC who was elevated to the position of Deputy Commanding Officer, Forces Command. Command transition is in progress and a Change of Command Ceremony is being planned for early January. Details on the CoC will be advertised as soon as they are determined and the ceremony is planned to be transmitted through the 15th Brigade’s Facebook Group. 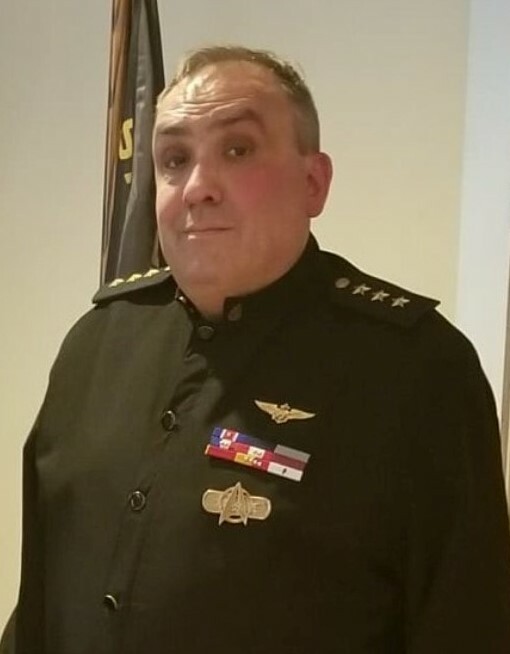 LGN Fest also serves as Commanding Officer of the USS Ares and is assigned to the 95th Survey Group (Combat Engineering Branch), also known as the “Martian Modulators”. He is a graduate of Officer’s Command College and the College of Starship Design at STARFLEET Academy. Among his many decorations and awards are, Order of Babel – 2nd Class, Leadership Device – Intermediate, Brigade Muster Award, Sword of Valor, Leader’s Commendation, Brigade Achievement Award, Brigade Service Commendation, SFMC Achievement Award, Good Conduct Medal, Joint Service Ribbon, Community Service Citation and the Sword of Honor. He received his Aerospace Wings Device on 201601.25 and was issued the call sign “Ratchet”. This afternoon, following the International Muster I received the Honor Awards announcement from SFMC Headquarters. I have spent the last few hours checking it, …… and then checking it again. In the 15 years since the activation of the 15th Brigade, only one time has a member of the Nameless Ones ever received an Honor Award. The Honor Awards are selected by the members of the General Staff from the nominations forwarded to them from each of the Brigade’s Valor Award winners. Given this represents each Brigade’s most dedicated and committed members. As such, being selected for Honor Award recognition is no small feat. Hence why in 15 years, there had only been one recipient from among our ranks. This afternoon, that number tripled. One of the best parts of my job as Commander of the Brigade is the opportunity it affords me to recognize our marines for their hard work throughout the year. As some of the highest awards issued at the Brigade level, the Valor Awards recognize the best our Brigade has to offer on an annual basis. These awards are issued based on nominations received from around our region and then are selected by a committee made up of the Unit Commanders, led by the Brigade Operations Officer. Once selected, they are submitted to me to be issued and then submitted to the General Staff of the SFMC for consideration as our nominees for the Honor Awards. These were announced publicly for the first time last weekend at the R15 summit but I wanted to get them posted here since the Honor Awards are being announced at the SFMC International Muster this afternoon. Congratulations and thank you for all your hard work. I wanted to follow up with you all regarding the SFMC annual awards. To date we have received 3 nominations and are looking forward to more. So I encourage you all to spread the word about the SFMC Awards and think about nominating one of the marines in your Chapter/Unit for one of the Valor or Merit awards. Take a look at the list of awards at the end of this post and write a nomination for one of the Marines on your team. Remember while the recipient of the awards does need to be either and active or reserve member of the SFMC, nominations can be submitted by anyone. Also remember that you are not limited to the marines in your chapter/unit. You can nominate any marine in the Brigade for an award. The nomination phase will continue till Friday June 22nd. Please send all nominations and questions to me at Workbee18@yahoo.com. The Brigade awards committee is excited to see the different nominations we receive. When considering nominations for these recognitions it may be helpful to bear in mind that these marines selected will be our nominees to be recognized as the SFMC’s best. In addition to these awards, there are a number of recognitions available to recognize contributions by members of the Brigade in a variety of areas. As these are not annual awards, there is a time requirement on most of these that the activity for which the marine is being recognized must have taken place within the last 6 months. Brigade Service Commendation: Issued by the Brigade OIC, this award recognizes marines for exceptional service to the Brigade over a period of time. To be eligible for this award, the nominee needs to have served in an official capacity for at least 6 months. SFMC Achievement Award: Issued by the Brigade OIC, this is similar to the Brigade Service commendation except it is for a specific service or task. The accomplishment should be of regional significance and reflect favorably on the Brigade. Meritorious Unit Citation: Given to an MSG for either consistently outstanding performance over time or for a specific accomplishment of a high standard. This awards neither recommends unit for or precludes unit from the Unit of the Year. If you would like to know more about the awards you can reference Section 8 of the Marine Force Manual via the following link. If you’d like to see a marine recognized and you don’t see an award that fits, please reach out to either myself or Tom Guertin, the BDE OIC at copysith@gmail.com and we will be happy to provide guidance. It is important to note this list only includes awards issued at the Brigade level. There are also many awards issued from the corps level as well. With 2018 well under way we find it is time once again to consider recognizing the work and efforts of the marines in your chapter/unit by nominating them for one of the SFMC annual awards. This is important for the Brigade as it of course gives credit and a well deserved pat on the back to a marine who deserves the recognition by going above and beyond the call of duty. It also helps us reflect on the past year and the fun things we did, and inspires us to move forward to new adventures. I encourage everyone to read the list of awards at the end of this post and really think about the marines that you interact with here in the Region/Brigade. Take some time to consider recognizing one by writing a nomination. While the recipient of the awards does need to be either and active or reserve member of the SFMC nominations can be submitted by anyone. Also remember that you are not limited to the marines in your chapter/unit. You can nominate any marine in the Brigade for an award. While the focus at this time is the annual awards you will notice that the different merit awards are listed as well. Feel free to nominate someone for one of those as well. The official nomination phase will go from now till Friday June 22nd. Please send all nominations and questions to me at Workbee18@yahoo.com. All the members of the Brigade awards committee look forward to reading the different nominations we receive. So look over the awards, put your thinking caps on, and have some fun writing a nomination for one of the many deserving members of the 15th Brigade.